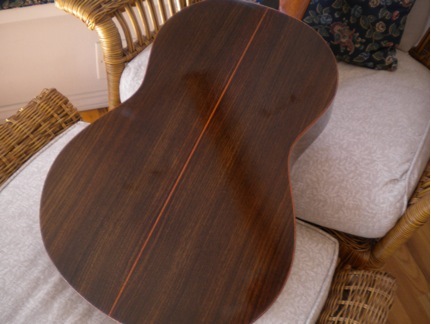 East Indian Rosewood is plentiful and available in excellent quality. I hand selected my own inventory from over 2000 sets available to me. Supplies of this wood from India and other countries is sustainable and responsibly harvested. I prefer dark, tight, close grain wood which I find gives terrific sound and outstanding stability over the life of the guitar. There is a reasonable consensus that Indian will give a warmer, bassier sound relative to Brazilian. It is my standard wood as it returns the best value of all. It is easy to work with, predictable and capable of making great guitars. Make no mistake, many of the best guitars in the world have been and are being made with East Indian Rosewood.